Wipe up food and other spills right away, using a dampened, but not wet cloth. Then wipe the flooring dry with a dry cloth or paper towel. Vacuum regularly, or when you notice that your floors are dirty. Our Tampa Bay soil will abrade your finish very quickly so you want to keep it off your hardwood floors. Use a brush attachment. Make sure that no metal parts come in contact with the floor because they will scratch it. Use the bare floor setting. You can also sweep with a soft broom, or use a dust mop, but do not use a household dust treatment or floor polish as this may cause your floor to become slick and will dull the finish. 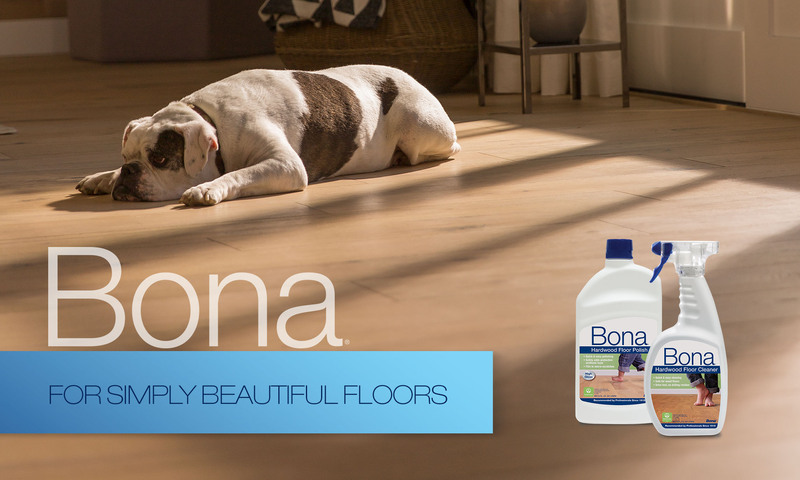 Clean your floor using Bona's easy to use spray on cleaner. 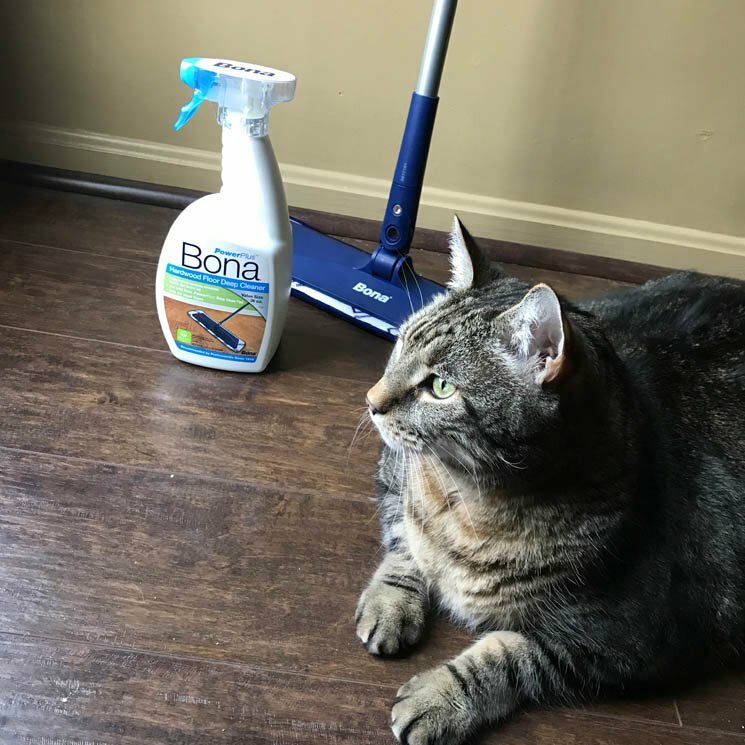 After sweeping or vacuuming, you just spray on a small amount and wipe it up with the Bona mop. Never use an abrasive pad or cleaning compound as this will dull your finish. Most spots that don't come up with water can be removed either with paint thinner or de-natured alcohol. Use these sparingly on a cloth. Alcohol is especially good for removing rubber marks from black bottomed shoes. Do not use other cleaning products on your wood floor. Do not use an oil soap. Do not use furniture cleaning products or polishes. Do not put wax on it. Wax is very slippery and in no way will using it benefit your floor. You'll probably observe tiny cracks between the flooring strips during dry seasons or long heating periods. This is normal and expected. Moisture in the air causes wood to expand. Then, when humidity levels are low, the flooring contracts and the cracks become more prominent. This is more noticeable with wider planks, (4" - 8") and with white or very light floors. Usually this contraction is greatest the first year of the floor's life and occurs mostly in winter because of the lower humidity in the home caused by heating. These cracks can easily be filled with colored putty type fillers designed for wood, which you can apply yourself. All floors natural or stained will experience some degree of color change over time, due to sunlight and aging of the finish. Different woods have different degrees of hardness, however, even the hardest woods with the toughest finishes will scratch and dent. Use dirt-trapping, walk-off mats at all exterior doors to help prevent dirt, grit and sand from getting inside the building. Throw rugs or small sections of carpet just inside the entrances are also helpful. Dirt and grit are any floor's worst enemy and that includes car-pets and vinyl floors as well as wood. Protecting wood floors Tampa BayPut fabric or felt-faced glides on the legs of your furniture including pieces you do not expect to move. They allow furniture to be moved easily without scuffing the floor. You can get them at hardware or building supply stores. Clean the glides regularly because grit can become embedded in them. Some furniture may require barrel-type roller casters as ball-type casters may cause damage. Area rugs are a smart investment for high traffic areas, especially under dining tables and chairs. Rolling office chairs should have area rugs under anywhere that they roll. Do not use the protective rubber mats with protrusions on the bottom of them. They will make a pattern of dents on the floor. Keep high heels in good repair. Heels that have worn down or lost their protective caps, thus exposing the steel support rods in the heels, will dent any floor surface, even concrete. To assist you in maintaining your floor's life & beauty, we are offering a new service: Professional Deep Floor Cleaning. Dirt can abrade your floor, actually scratching your floor's surface, dulling the finish, dimming its beauty. Our new Dirt Devil is a powerful floor cleaning machine that removes the toughest dirt and surface contaminants from all types of flooring. Much more effective than traditional mopping, the Dirt Devil aggressively cleans dirt that can accumulate over time, in even the cleanest home. 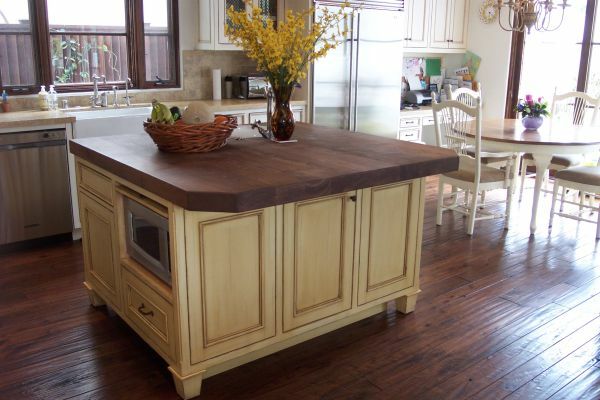 When your finish becomes dull or worn away, it can be renewed by lightly scuff sanding the finish surface and then applying another coat of finish. How often you should do this re-coating can vary between one to six years. Kitchens and other heavy traffic areas will need to be recoated more frequently too. The time to do this is when the floor is starting to look worn and does not clean easily. If you should let a floor go too long without re-coating, it can not be brought back with a simple re-coat and may need to be sanded and refinished. A floor has only so many refinishes in it before it must be replaced, so you definitely want to recoat it when needed. This renewal process cannot be done after wax or many cleaning products such as oil soaps or dust sprays have been used without a complete sanding of the floor.